Win A Free TVOOD 24 Large Pockets Over The Door Shoe Organizer | FreebieOrBust Freebies! We have a new sweepstakes! We all receive limited opportunities in our life, and this could be your chance to take advantage of our platform and win! TVOOD 24 Large Pockets Over The Door Shoe Organizer, Hanging Shoe Storage Holder for Space Saving, (62”Lx21”W) Beige. According to Amazon, the odds are: 1:800. They have this prize available for 2 winners. 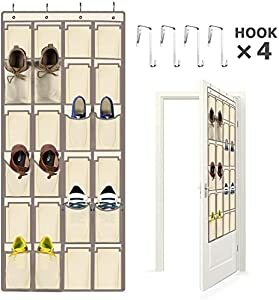 Sweepstakes hosted by Amazon and Over The Door Shoe Organizer.